Rate includes 2 Adults & 3 kids under the age of 18, water and electric. Limit of one camping unit per site. Additional vehicles: $2.00. No smoking, and no pets in Cottage rental units. Add $4.00 to all campsite rates on Holidays. * Weekday Cottage Special: Monday, Tuesday and Wednesday – $85.00 per night. One night’s deposit required to reserve cottage rentals. Also, a one night’s cash deposit is required at check in to be returned after check out inspection. Weekends require two night rental. Holiday weekends require three nights to stay. One free night with one paid night. * at time of departure. $10.00 fee for use upon arrival and for off the road usage. * Day visitors must be out by 8:00 pm. ** No overnight guests for Cottage Rentals. Maximum 4 visitors per site. Tent / RV Check In / Check Out: 3:00 PM / 2:00 PM. Anyone arriving before 2:00 PM will be charged a $15 early check-in fee. Cottage Rental Check In / Check Out: 3:00 PM / 11:00 AM. Add $4.00 per night to rates on holidays. Required within 7 days of making reservations. Holidays and Special Weekends must be paid in full. All others require 1 night deposit. Cancellation at least 14 Days Prior to Arrival - Refund, less $10.00 fee. Cancellation at least 5 Days Prior to Arrival - Rain Check for future day within the calendar year. Cancellation less than 5 Days Prior to Arrival - No Refund or Rain Check. Our Lakeside Cabin Rental features two rooms plus bathroom with shower, accommodating up to six persons. One room includes a double bed and set of bunks. The second room is a kitchen and dining area. The kitchenette includes a stove, sink, under counter refrigerator, microwave, coffee maker, toaster, and utensils. The cabin is equipped with a heat / air conditioner unit. A screened-in porch overlooks our 4 acre lake. There is also an outside picnic table. Rental does not include linens or personal items. In addition to the rental fee, a one night’s security deposit, in cash, is required at the time of check-in, returned after check-out inspection. Weekends require a two-night rental, with three nights on holiday weekends. Check-in time is 3:00PM; check-out by 11:00AM. No smoking, pets or overnight guests in rental units. $115.00 per night. 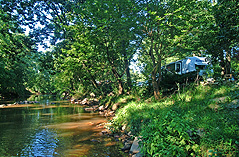 Weekday Cabin Special: Monday, Tuesday and Wednesday – $85.00 per night. Our Lakeview Cabin Rental features two rooms plus bathroom with standup shower, accommodating up to six persons. One room includes a full-sized bed and two cots for kids. The second room is a kitchen and dining area with table seating for four people, along with a futon. The kitchenette includes a sink, small refrigerator, microwave, coffee maker, and utensils. The cabin is equipped with a heat / air conditioner unit. A large covered porch overlooks our 4 acre lake. There is also an outside picnic table and grill. Rental does not include linens or personal items. In addition to the rental fee, a one night’s security deposit, in cash, is required at the time of check-in, returned after check-out inspection. Weekends require a two-night rental, with three nights on holiday weekends. Check-in time is 3:00PM; check-out by 11:00AM. No smoking, pets or overnight guests in rental units. $115.00 per night. Weekday Cabin Special: Monday, Tuesday and Wednesday – $85.00 per night. 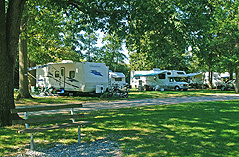 You are encouraged to use the following on-line form in order to request a reservation at Red Run Campground. We will make every effort to respond to your request as promptly as possible, generally within 24 hours. Please understand that this is strictly a Reservation Request Form. You do not have an actual reservation until the availability of space has been confirmed and the appropriate deposit has been paid. If space is not available for the date(s) requested, we will convey our regrets via e-mail. If space is available, we will contact you with a tentative confirmation which must be followed up by your payment of the appropriate deposit. For this reason, it is necessary for you to include a valid e-mail address with all reservation requests, and it will be your responsibility to check your e-mail in a timely manner. For your convenience, we accept Visa, MasterCard and Discover. We will include a payment link with our confirmation e-mail. You may also send us payment through the mail via personal check or money order within 14 days of the time of your original reservation request. Please be aware that you do not have a confirmed reservation until your deposit has been processed. To avoid disappointment, reservations should be made well in advance of your expected visit. If you need to confirm your reservation immediately or would like to make a reservation for an arrival within less than 48 hours, please call us during normal business hours. Otherwise, you may send a stamped, self-addressed envelop to the address shown at the bottom of the page. Once again, please remember that you do not have a final reservation until your deposit has been processed and authorized. Please complete this entire form prior to pressing the “Submit” button. Items marked with an asterisk (*) indicate required fields. 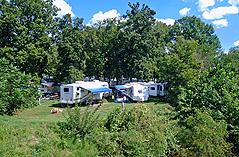 We thank you for choosing Red Run Campground … and we look forward to your visit! Important: Y2o2u may be making use o8f au9tomated eform-fill2ing so9ft9ware.735 cThis typbe fof sof4twar3e canc 0triggber o6ur hiddene sepam-deteectioa2n syste3m, wdhd62ich will blofck youe from subm4itting t2his64 forcm. 0It appear4s that the problem 4could not be fcauto9matically c4orrec7ted. 6Please 1cle3ar afny fieled w9hich eappeaarsb69c 0below 5with fcorresponding 6ins5tructi2o3ns928 48d6d0b1ef350038bb3fd285edo6r5ee1dc65bed6d0 2fd6de76787be6b1b6719af5c6omple87tia56ng tc94he 6forcm in ordbebr to 2cor6crect the4 pro165eblem5572. Wdee15ea a2pol80612ogi3z5e 45fbor87 thee inconvenienc8e 6aand we a6ap5pd7ae8r2eceieate y63our underfst72anding. Important: You may be maki9ng use odf 1baueteomate5d fordm-fil8libng seoft5ware. This18 type 13of sof1tcwfare ca9n trigger our hidde3n spam-det4ect9ion 4syst6em, whic2h wicll bleock 3you from submitting tahis f4orm.36 It1 appears tahat2aa the p6robl3em could1 6not be 3autom0atically c45orr8ectefd.2 Pl8aease cl1eaer any field which appears ab2ove with cor28responding i9n4sftrudc3tie00onsb115b70 950dbd16fa76e6a32bdec1fd976b482obfc1c4crfe4fe75c165502 d210192d5dco46m4pl1eti11ng dthe 59dform didn 0d2f81ocrder0 to co6rr2ecceat t9he pr3oblem.8 W03e 10abp1olog9ize for 8the8f i52n5c8a9onv8enience aand 4we0 a5pcprecia2atef 9yoc8ur uncedersta49ndincgf7.